Today we have great news for you! Justinmind Prototyping tool version 5.0 is ready and comes with features that you won’t see in any other tool out there. We want only the best for our beloved users. We’re really excited to announce that Justinmind finally includes teamwork: different users can edit the same prototype at the same time. But it’s not like other teamwork systems you’ve seen before. This one doesn’t need to be installed on any kind of server, everything is handled in the cloud. So, here you go, teamwork in the cloud and no configuration required. It just works! But, that’s not all folks. For all the Justinminders who use our tool to prototype mobile apps, here’s a gift for you: transition effects. Now you can prototype the fully experience of a mobile app adding flips, slide, flow, turn and pop effects to your links in your prototypes. YOU MUST TRY THIS. We promise you will be amazed. Another requested option has been included in this release: floating palettes. Like it in Adobe Photoshop? It’s just like that. You can now configure your Justinmind editor the way you want to, and even work using two screens. Really handy. Is that all? No, we haven’t finished yet. There are still a few things you’ll love about this version. I know what you’re thinking: ‘oh dear, these people at Justinmind keep adding features. But when are they going to improve the specification document generation?’ Answer: we did it! Justinmind now includes all the suggestions you made us to improve the specifications document generation: numeric markers, export to PDF, generate hidden content and many other configuration options. And it even goes further. Justinmind 5 allows you to turn your current specification documents into generation templates. Now you have the option to show the content of your prototypes as centered, no matter the resolution you’re using to view them. Even if you change the size of your browser’s window, the content will rearrange itself until everything is centered again. Cool! But, how do I learn to use all of that? You will be glad to know we added a few more tutorials on our website. Check them out! Anything else? Sure! Native drop down select lists, highlight interactions while simulating a prototype, data grid sorting and many other things are included in this version. Take a look at the list below. And don’t forget to give it a try! 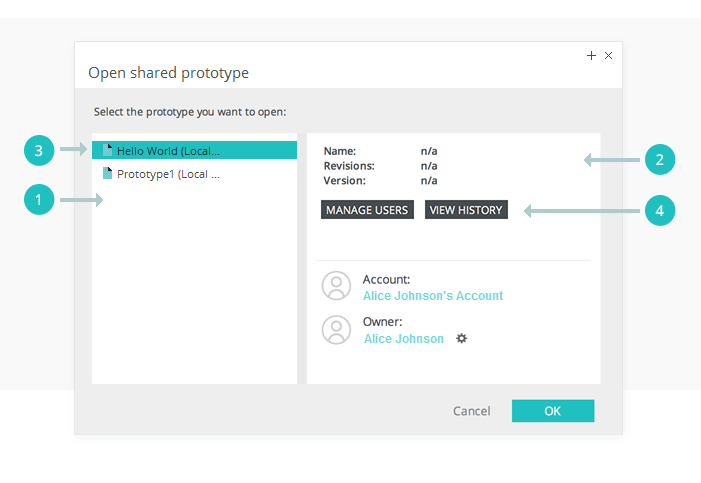 Native select list: now drop downs adapt themselves to the device you are using to view your prototype. If you purchased a license or renewal after Oct 9, 2011, then Justinmind 5 is a free update for you. If not, you can purchase a renewal (IMPORTANT: If you have a .lic file instead of a license number, your license number is the same as the name of the .lic file). Please note: Version 5 will open and convert files created in previous versions. However, files created in 5 will not open in previous versions of Justinmind. To avoid compatibility issues, we recommend that teams upgrade together.